1. Hello, give us a presentation of the band. And what do you do except playing with M:40? The band contains of Simon - Drums, Johan - Bass, Daniel - Guitar & Vocals and Sebben - Vocals. Apart from M:40 we have ordinary works. Simon and Daniel are employed on a big bakery. Johan are within the car industry. And Sebben have been affected by the crisis and are "between two works"
2. You'll soon go for a mini tour in Germany, any excpectations? You have done some tours before, which countries do you like most and what's the biggest difference against Sweden? This tour will be really fun, it's almost two years since we played in Germany and it will be great to play this gigs with the nice people in End of all. It's just four gigs so it will be very intensive. Germany use to have a good scene. The Czech Republic was our favourite but then we visited Russia and that's probably the best country we've played in. The audience take an more active interest in the gigs outside Sweden, they don't take it for granted. It use to be good in Sweden too but sometimes it's too tired mood. 3. I have never read a bad review with you guys. Are you so angry for real or do you just have the sound people expect from a band within this brutal scene? 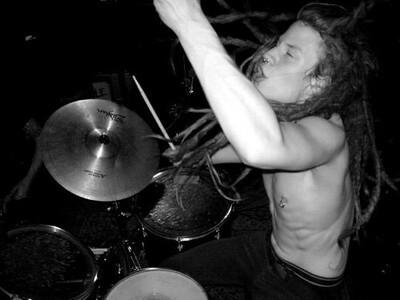 How the hell can you be such a fantastic band? Tell me what people use to say about you? Haha, it's always fun with good response. And we can just say thanks a lot. But the first review we got on our first demo was a disaster. But with all rights, that wasn't good. Our songs is not so complicated and we are probably angry for real. 4. What's your favourite bands? Let's do some namedrop: Tragedy, Kylesa, Switchblade, Skitsystem, Cult of luna, End of all, The Knife, Fever Ray, Black Sabbath, Doomriders, Dillinger escape plan, Mastodon, Splitter. 5. Describe your hometown Lidköping, any good venues? And how much people is it on the gigs? Lidköping is a quite small town with a number of inhabitants around 35.000. It can, with some luck, turn up maybe a few hundred at the gigs, but sometimes it can be maybe 10 persons so it's not total safe to put up gigs. The last year (2008) we put up some punk/hc gigs in our rehearsal local and that was often good, or it came enough people for not lose any money. There's some groups who arrange gigs then and then but not any particular locals. We had a rockbar who closed for not so long time ago. We have also a "youth house" where the arrangements not have been very good. 6. You are not lazy as a band, and release at least something every year. What's the difference between now and when your first record was released? To compare our first record "Tomma ord är inte värda ett skit" with the last recording "Industrilandskap" + Our split with Sand Creek Massacre I must say that our sound have become darker, more aggressive and more tight. Maybe it was some more humour on the first record, maybe not fun as hell but it was different. We have still very fun but it wasn't that carefully as we try to be nowadays. We just played without any special ideas. 7. 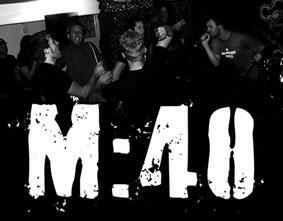 Are M:40 an etablished band yet so much people will visit your gigs. I think it's a big problem with Sweden that there's so much people who don't come to gigs with not so well known bands. No we are not that big yet. And as you say are people a bit lazy and prefer to stay home to drink insted of visit gigs. Even when big bands play as well. Sad but true. 8. What's the deal between Hobo, Em Records and Halvfabrikat Records? Some labels from different countries have been involved in our releases but it's more or less always Halvfabrikat who release our records. Hobo Rec have the studio in Jönköping where we have recorded all our stuff. Our first Cd was a DIY production and we came up with the name Em Records. It have been great to work with Danne (Halvfabrikat) and I suppose that we will continue in the future. 9. Who in the band get all the groupies and who take care of the technical stuff and who are most interested to get alcohol when you visit a new venue? Since we don't play that kind of rockstar music I think I have to pass the first question. Johan "Mr. Elektroniker" can always arrange the technical stuff when it's problems. And we all drink with pleasure, that's the half thing with the whole gig, isn't it? Okey, that was all for now. The band was going to get up early in the morning for their trip to Germany. tycker det e skitbra du håller på å att översätta till engelska är en bra idé så att människor utanför sverige kan ta del av dina skriverier, men spontant måste jag säga att engelskan är fruktansvärt dålig. inge illa menat, men de flesta rader är helt fel på alla sett och vis.